scoopy (Emily) was the featured stamper over at Split Coast Stampers today - she has a gallery full of wonderful clean and simple cards - the kind of design I tend to gravitate towards! 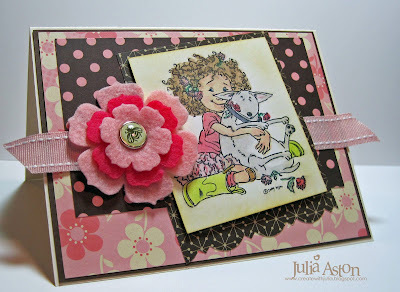 I chose her pretty daisies in a row card to CASE today. I used different stamps and sentiment, and stamped my flowers on a panel framed by an embossed Nestability square. Fun news! 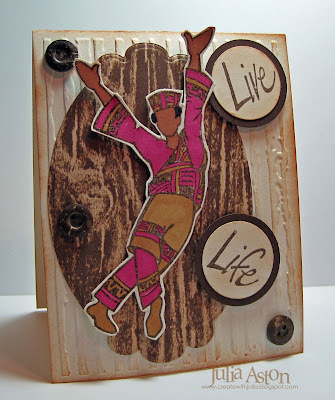 - The Waltzingmouse Design Team will be having a DT Blog Waltz on Tuesday June 1 highlighting some of Claire's first stamp sets. There will be WMS sets to win by leaving comments so be sure to come by!!! Happy Memorial Day to everyone who lives in the US! Today we remember and thank all those who have served or lost their lives in the Military Service protecting our country and it's freedoms. ETA: sorry - I'm two days ahead of myself with celebrating Memorial Day! It's the 31st of course - but our town parade is held on Saturday - so I get confused !! LOL!!! and actually we celebrate the whole long-weekend I guess depending on when people have cookouts etc!! The inspiration challenge today on Split Coast was the Crate & Barrel web site store. 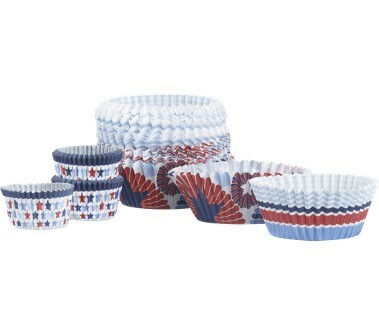 I wanted to make something patriotic so I searched the site for 'stars' and found these fun cup cake holders. 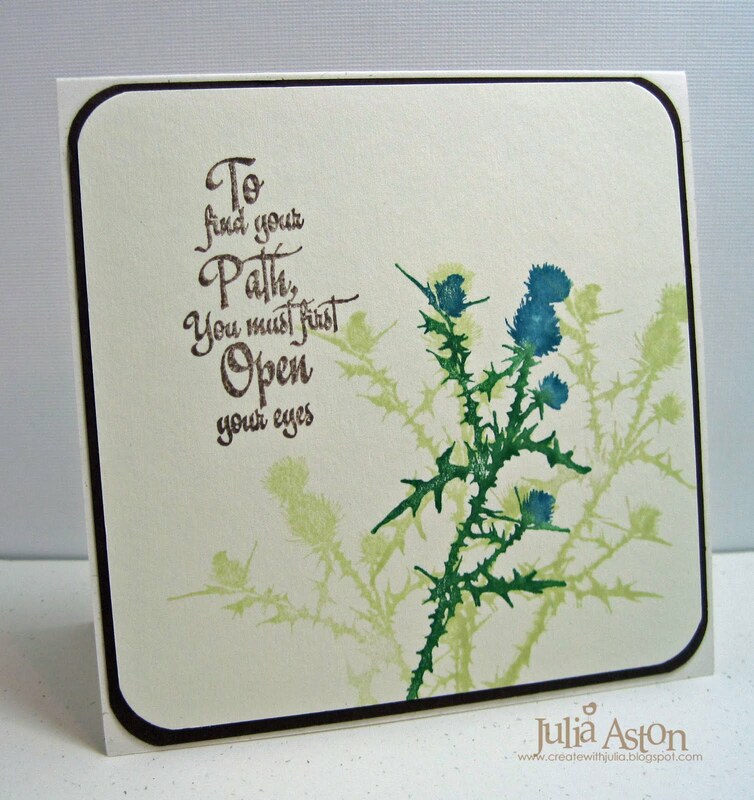 And here's the card I created from that inspiration. I used my Fiskars Crimper to simulate the ridges in the cupcake holders. I thought these wonderful blooms looked a lot like fireworks when stamped randomly on the panel. Here's what I put on the inside of my card today. My sentiments are from the set Free Spirit-Sentiments from Waltzingmouse. 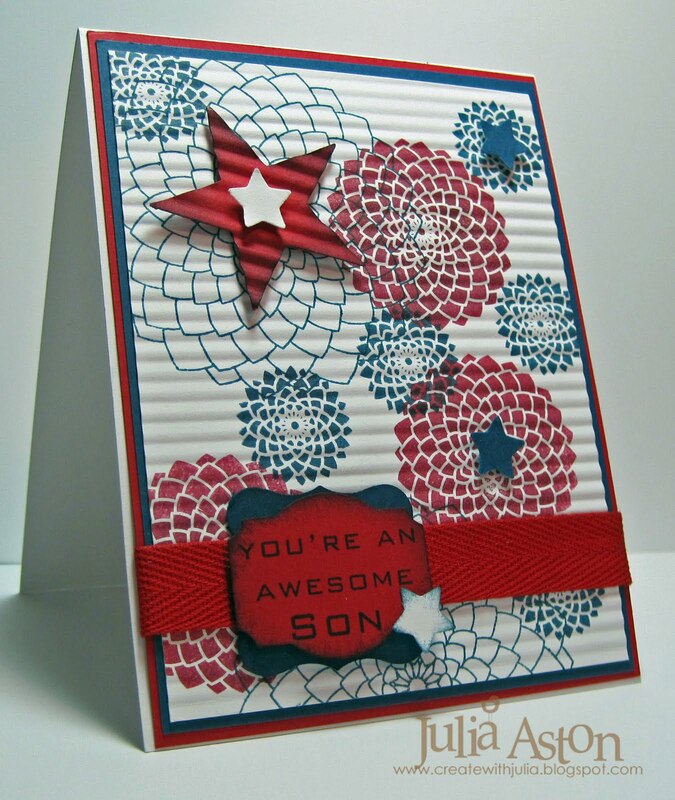 This card will go to my son who served in the US Army for 6 years. And I am so proud of him for serving his country. My card also fits Sharon's Friday Stamp Simply challenge - to use the colors of your countrys' flag on your card. 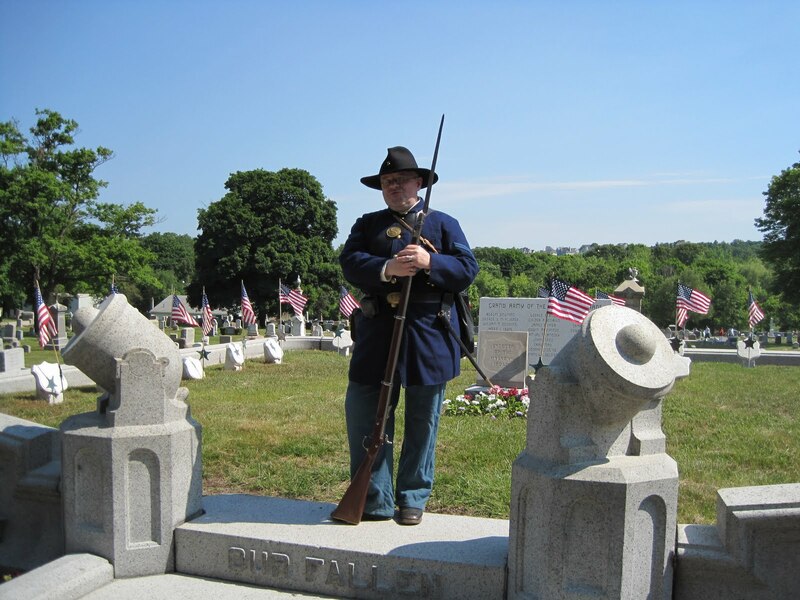 And here is a picture of our friend Steve, who is a member of a military reenactment group. Today he marched in our town's Memorial Day Parade in his Civil War uniform - and then he stationed himself in the Civil War section of our town cemetary during the services there. I'd appreciate your prayers for my dear mother-in-law, Marjorie, who went to be with God Wednesday night. She would have been 95 this July 6th. 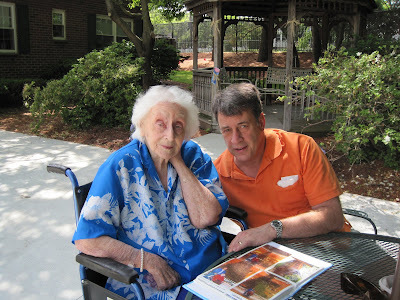 She had been pretty healthy and active until about 6 months ago when she began a decline and had to move from assisted living to a nursing home. We are thankful that God wrapped his arms around her so quickly and took her home - free of her tired human body. Accessories: Martha Stewart butterfly punch, glue pen. Here is my Clean and Simple card for this weeks CAS challenge over on Split Coast which was 'Think Summer'. What should have been a simple no layer card done quickly turned into a simple no layer card being stamped 3 times! The first time I got a smudge of blue sky on the sand and on the 2nd try I got a streak of black in the sky from the sentiment - Yikes!!! Then my Chai ink cube dried up and so the 'sand' on this third rendition looks much darker than the first two. So here it is - a sunny day at the beach! I punched a circle for a stencil and sponged the sun, then I covered the sun with the circle and cut a curvy mask with Eclipse tape to sponge the sky in two colors of blue. Then I inked the beach with a cube ink pad direct to paper to give it a little texture from the lines of the cube. My surf board and sentiment stamps are from Waltzingmouse Stamps . 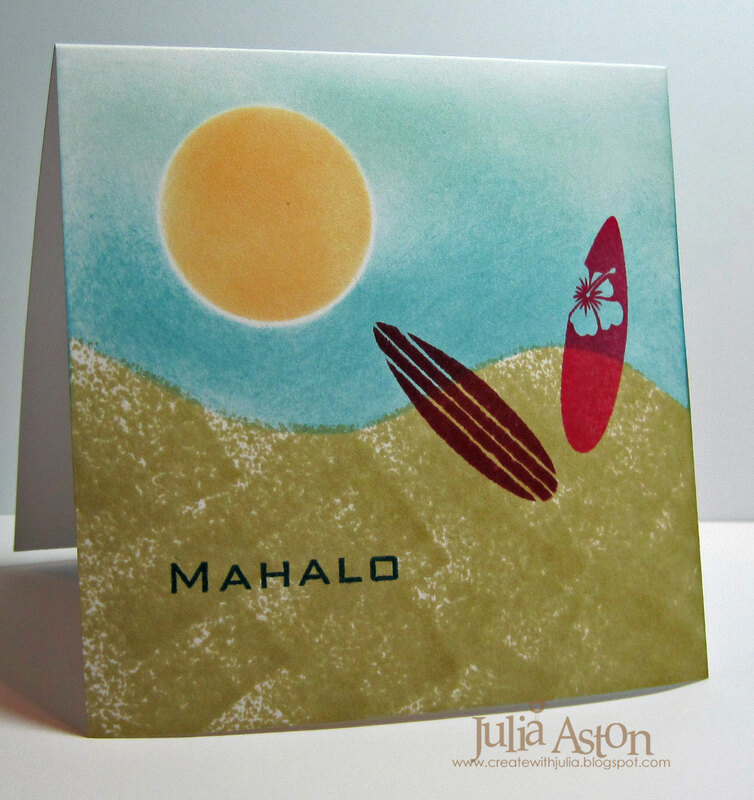 Mahalo is 'thank you' in Hawaiian. Mahalo for finally letting me finish this card without a smudge on it!! 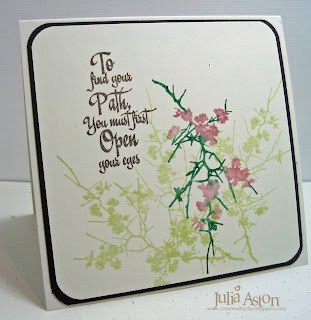 NCSUNikki was the featured stamper this week over at Split Coast and I chose her pretty Thoughts of You card to CASE. I used different stamps, a different edge punch and didn't tie a bow on my ribbon - but the main essence is her card! I love this top note style card - my card base is 5 1/2" x 3 5/8" and my top note is 3 5/8" x 4"
Wow - what exciting and beautiful cakes and table settings on the inspiration site, Amy Atlas Events, for Saturdays Split Coast Challenge! 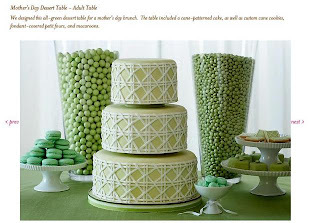 I chose this pretty Mother's Day Table setting to inspire my card. 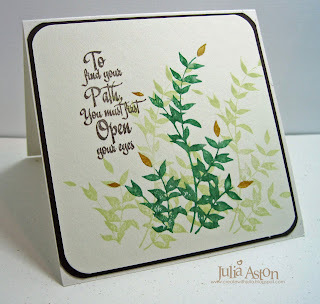 I embossed my background stamp with white EP and stamped my sentiment on a Spellbinders Fancy Tags that I sponged with spring moss before removing it from the die. I added three buttons to suggest the candies in the jars on the inspriation picture.This will go to my college roommate who's anniversary was Friday (woops!) so it will be a tad late! 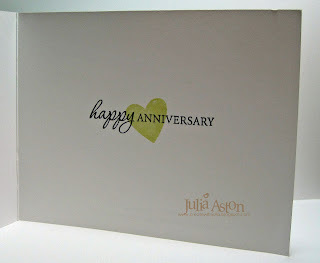 Inside says Happy Anniversary overstamped with a spring moss heart. I was a bridesmaid in their wedding and was 5 months pregnant with my son - and he will be 33 in Sept so I always remember how many years they have been married even if I forget the date! Say Hello to Zenfangle With Buttons and a Bow! 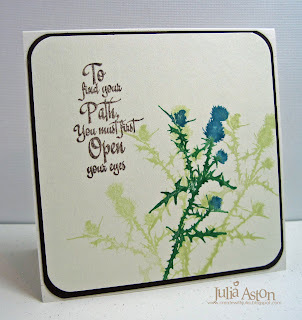 What a fun technique for us to try this week for the Ways to Use It challenge on Split Coast! Guest Host Beverly (ruby-hearted mom) introduced us to the art called Zentangle using pen and ink -black ink! My image is on a 4" square that I framed with black, grey and white. I always used to doodle on the sides of my notebooks in school (didn't we all?!?!) - this art form really takes it to the next level! Beverly is visiting in Boston this week (from TX!) and I work in Boston - so I PM'd her to see where she was and we were able to get together for lunch! We'd never met but 'knew' each other from Split Coast. We hit it off like long lost friends - isn't the stamping community a great one to be involved in!?! 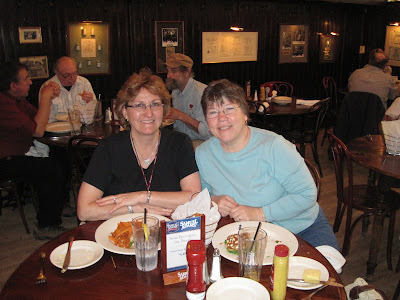 Here we are enjoying a great lunch at Jacob Wirth's in the theater district of Boston. Then we walked around the Boston Public Garden, saw the swan boats, and hit a couple of shops! 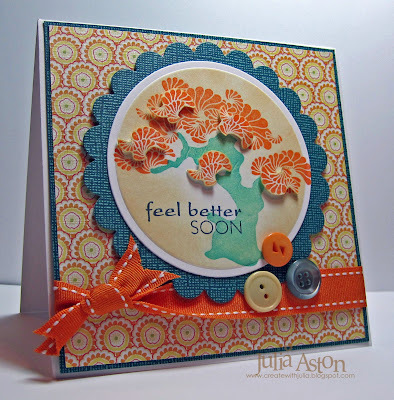 And here's my card for Friday's Free 4 All Challenge at Split Coast - to use Buttons and Bows. My stamps are from a beautiful set from Waltzingmouse Stamps called Asian Garden. I layered some extra tree leaves on the tree with foam dimensionals. I chose my colors based on the pretty DP. Ahoy Mateys!! This little sailboat card is for the Split Coast Teaparty challenge - to help Seth the Sailor who's alone and lost. This little sailboat is on it's way to help him find his way - you can see the 42,000 waves in the background (although I meant to mount the paper the other way up - OOPS!!) The beautiful nestie frame is helping tame the waves for Seth. I'm going to be a great- aunt for the first time to a little baby boy in September (whoo hoo!!!). 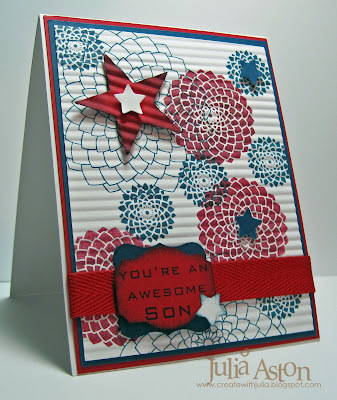 I'm starting to practice making baby boy cards so I'll be ready for the big event! 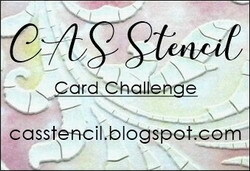 This is also for Monday's SCS technique challenge - to use a frame on your card. Here's what I stamped on the inside. All the stamps are from Bitty Baby Blessings by PTI. It's a great set for baby projects and has sentiments for twins and adoptions. 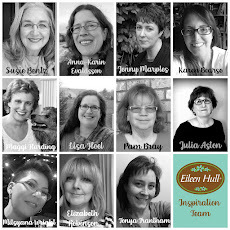 This week on Split Coast my blogging friend, Cathleen, was the Featured Stamper - Whoo Hoo Cathleen!!! big congrats!! 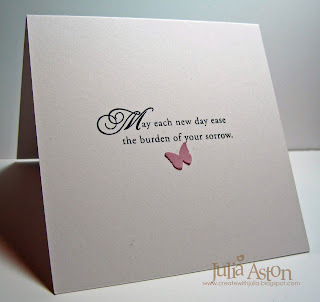 There were several cards in her wonderful gallery that I wanted to CASE but finally settled on this Red Butterfly Happy Birthday I changed the colors and moved the sentiment, omitted the pin and made the top piece a panel. 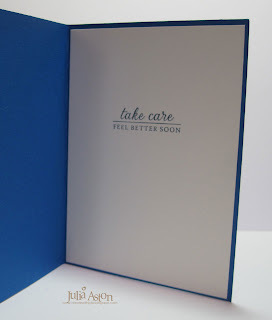 And on the inside of my get well card, I used a sentiment from Autumn Abundance by Papertrey Ink. 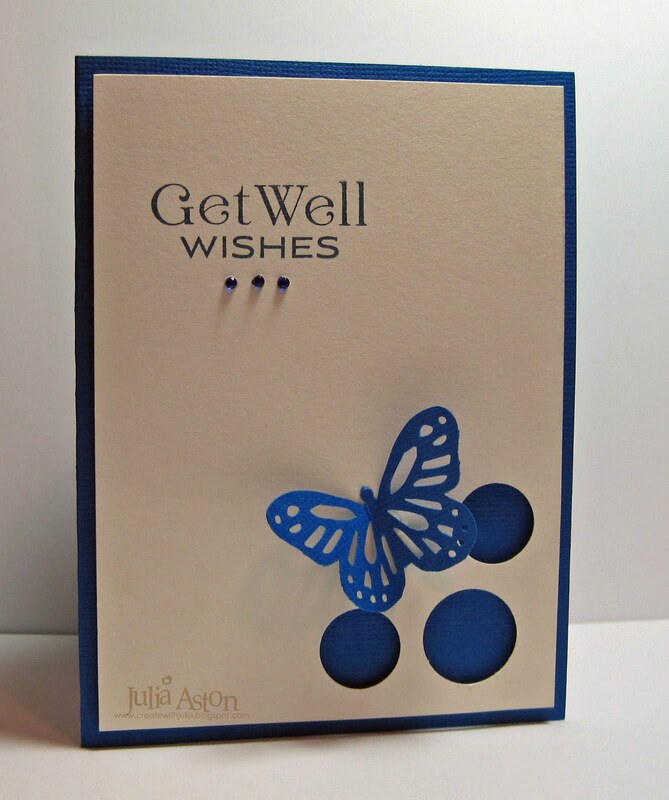 I love the simplicity of this design - and it would work for birthday, thank you, sympathy - what ever kind of sentiment you wanted to use on it. Don't you just love this little girl?!?!? She's Bella with her dog Bronte - a Mo's Pencil Digital Image. She looks just like my Godchild, Eden - so of course, I had to buy her!! See the resemblance??!! 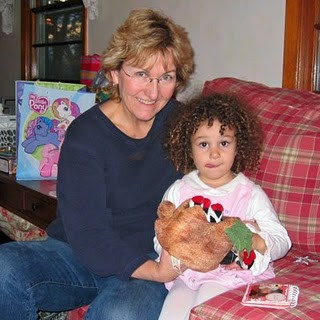 This is Eden a year ago - but she still has that full head of curls!! 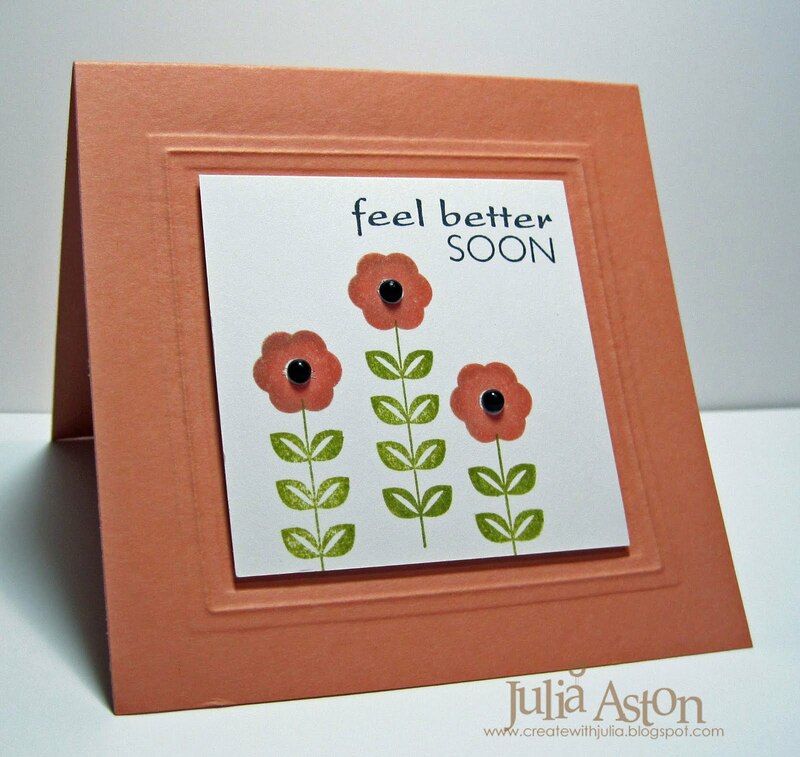 I made my card for Mo's Challenge #31 - to use a Mo's image and flowers. I made my own felt flower using my brand new Papertrey Ink flower dies - boy did they work well - they cut right through the felt using my Cuttlebug! The sketch is Mojo Monday #139. I used colored pencils and Gamsol to color Bella as well as a couple of Copics. Did you notice the cute bumblebee on the brad in the center of the flower? Cute huh!? Accessories: Koh-I-Noor colour pencils, Gamsol, glue dot, felt, Flower dies - PTI, bee brad - Basic Grey, edge punch - Martha Stewart, foam dimensionals, glue dot, saddle stitched ribbon - PTI, Copics - E51, R20, E34, C6, sponge. 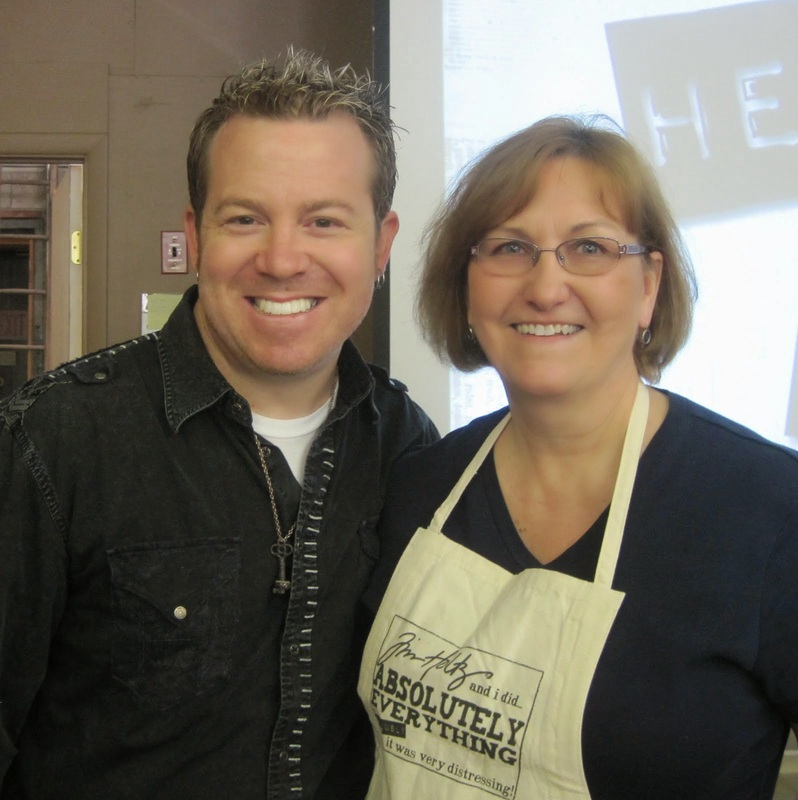 Friends of WMS May Blog Waltz! 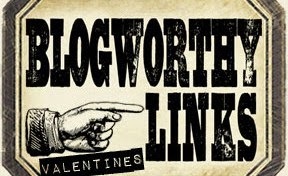 Welcome to the May Friends of Waltzingmouse Blog Waltz. The theme this month is Birthdays since May is the 1 year 'birthday' of Waltzingmouse Stamps!! Check out all the fun over at the WMS Forum in the Play Room where you'll find everyone that is participating in the waltz. I just love Claire's WMS piece of cake template and I wanted to try and make a masculine slice this time. 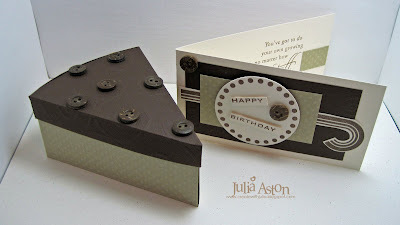 (see my other cakes here) I found some great textured Bazzill card stock at Michaels - the dark brown 'frosting' has swirls in it and the tan 'cake' has embossed circles. Then I just added brown buttons like chocolate chips or M&M's on the frosting! 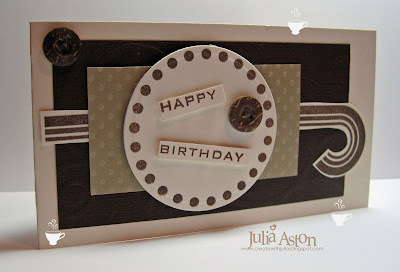 Of course - I had to make a masculine style card to go along with the birthday cake! So I started by using the same papers and buttons. 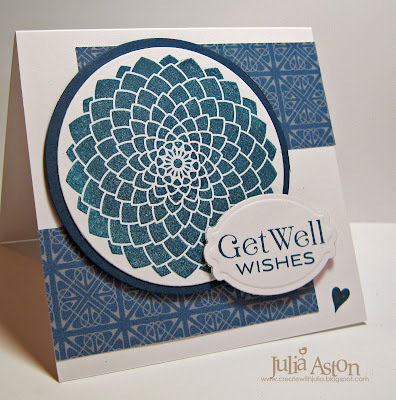 The dotted circle is from Faux Fun Circles, the sentiment is from Free Spirit Sentiments and the 'wave' is from Free Spirit - Boy. I used Mercy's Tuesday sketch for my card design. 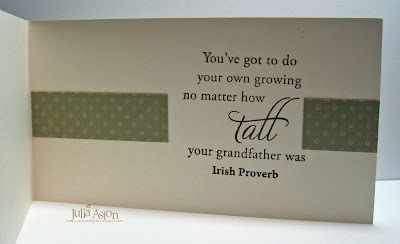 For the inside of my card - I adhered two panels of the dotted Bazzill on either side of this great Irish Proverb from Words of Wisdom! I lined my cake with Claire's Digitial Paper - Celtic Squares. Remember to count how many teacups I have 'hidden' on my card picture above - tally up all the tea cups on the Design Team posts and post your total in the Playroom of the WMS Forum - one person with the correct answer will win a stamp set of their choice. And one random winner will be chosen from all participants in the Waltz! 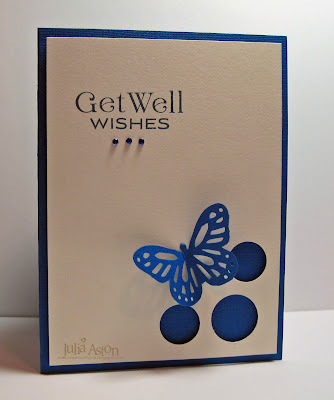 Paper: Bazzill Basics - embossed swirl & embossed dots, Vintage Cream - PTI, Digital DP Celtic Squares - Waltzingmouse. 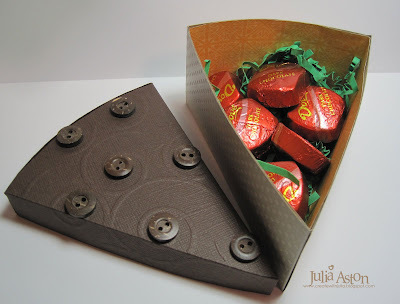 Accessories: Glue dots, foam dimensionals, vintage buttons - PTI, Circle Nestabilities, cake template - Waltzingmouse Stamps. 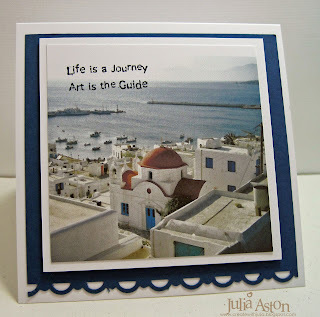 This week's inspiration challenge over on Split Coast was a fun web site called Two Lumps of Sugar. 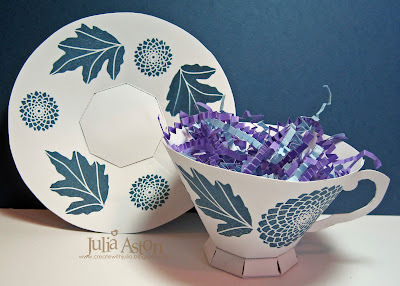 I was inspired by these blue butterfly plates . I got to use my brandy new Martha Stewart butterfly punch that I bought with my 40% off coupon at Michaels (whoo hoo!!) 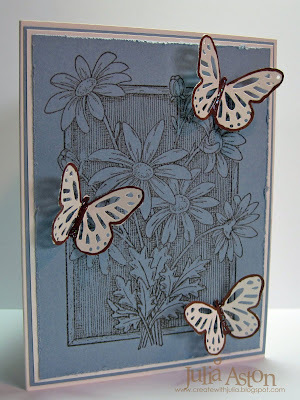 and also a brandy new stamp from Rubbernecker Stamps called Bold Florals - Daisies. Here's my card inspired by the dishes. I distressed the edges of my image panel for the Split Coast Ways to Use it Challenge from Thursday. 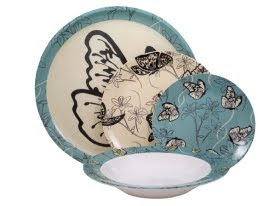 I colored the edges of the butterflies with a Copic to mimic those on the dishes. I love how this stamp looks just inked without coloring and I think the butterflies added a lovely dimension to the simple stamping! I think this card would work for a birthday, sympathy, thank you or just to say hi - don't you?! Father Dan was an interim priest at our church who recently retired after being with us for over a year. 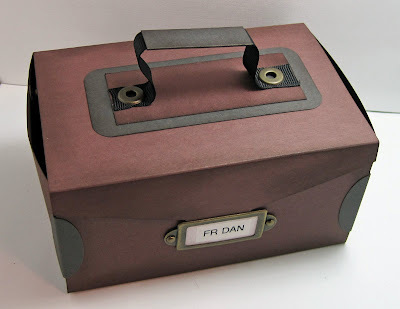 He likes to fish - so I made this fun tackle box to give him on his last Sunday with us. I purchased the pattern from Lisa at Stamndesign (she is SO clever!!) it also includes a fishing vest card pattern that I haven't tried making yet. 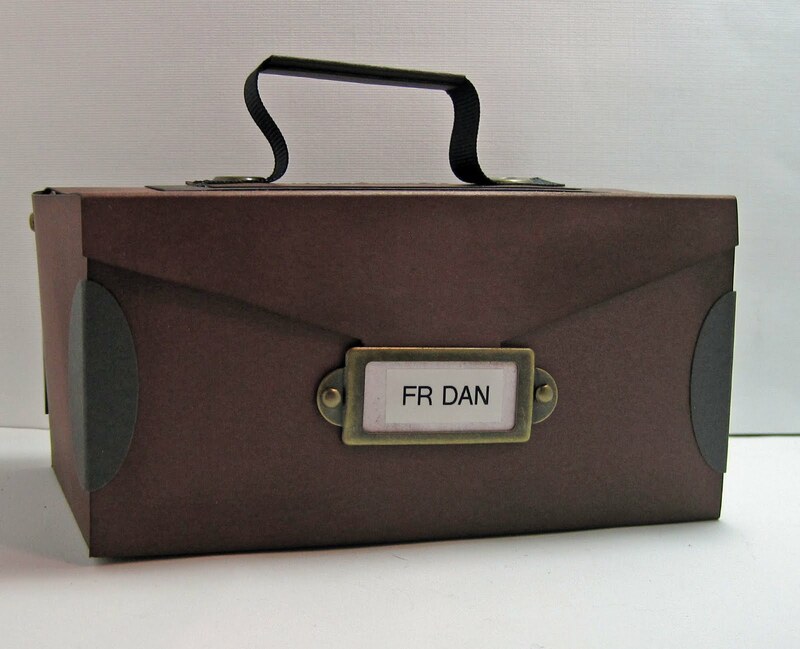 Look how wonderfully it is designed to open up on hinges and have the little compartment tray inside! It was really easy to make even though it looks very complicated! The tab on the cover just slips behind the metal name frame to close. If you wanted to be able to pick it up by the handle - you could use a piece of velcro instead. 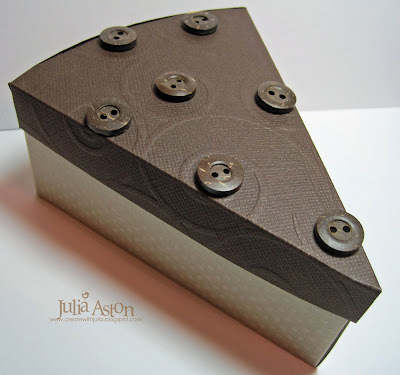 The hinges are made with the SU word window punch and you use an oval punch to make the pieces on the corners. 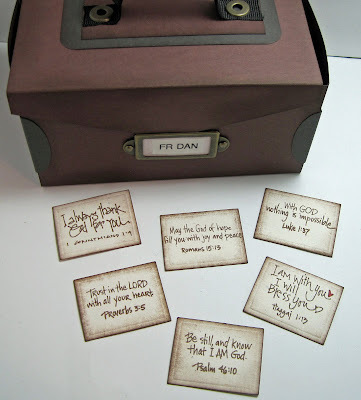 I stamped these little Bible Verse cards to put inside the compartments of the box. I also tucked in some gummy worms and red fish candies in the larger section (as well as a gift certificate for him) I forgot to take a picture of the candies - they looked really cute in there. A great gift for any fisher-person in your life don't you think??? Especially perfect for upcoming Father's Day!! I didn't have the SCS color challenge colors of Melon Mambo or Soft Suede so I used Copics in similar colors on my image. I even got the Dessert Option in by using wood grain designer paper! This great image is Demetri one of the new African American figures from Rubbernecker Stamps I clear embossed the image using brown and Versamark inks, colored it, cut it out and adhered it to the Labels Ten nestie panel with foam dimensionals. 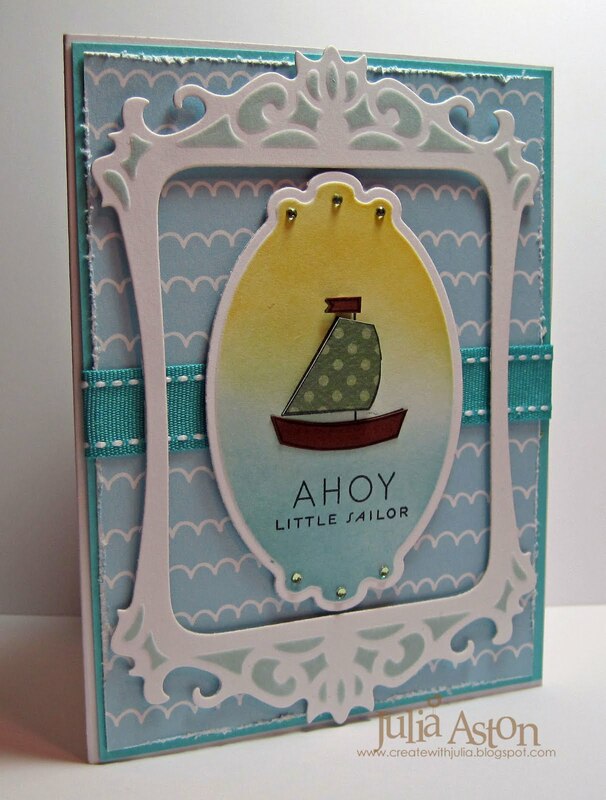 The card base is embossed with the Distressed Stripes Cuttlebug folder. Tonight DH and I are going to live life! We're going out to eat at Jacob Wirth's and then to the Lyric Stage to see Noel Coward's Blithe Spirit - fun way to start the weekend! What are your weekend plans??! And don't forget the friends of WMS Blog waltz on Monday - Check here for all the deets or click on the WMS flower on my side bar. We hope you'll join in! Isn't this Scrub Shirt adorable!?! This was just what I needed for my boss's birthday card today for all of us in the office to give to him. We tucked a gift certificate to his favorite restaurant inside. 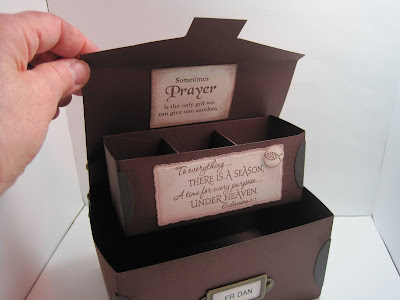 I purchased the template from Lynn (Stampndesign) here - and it also includes a doctors medical bag which I'll be making for the three doctor's I work for to hold their holiday treats later this year! You use various oval and circle punches to make all the pieces for the stethescope. I added the physicians name from his business card over the pocket - it was just a tad too long but the perfect size font. 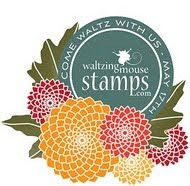 Oh - and I wanted to let you know that the friends of Waltzingmouse Stamps are having their monthly blog Waltz on Monday 5/17 over at the WMS forum - you can check it all out here as well as on my side bar - just click on the flowers! I hope you'll join us - there will be stamp sets to be won!! 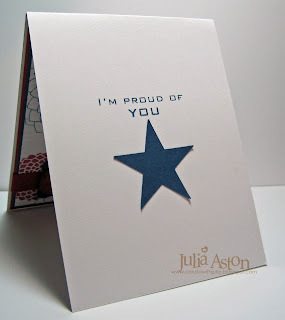 Itecler was the Featured Stamper over on Split Coast on Saturday and I chose her pretty Thinking of You in blue card to CASE. 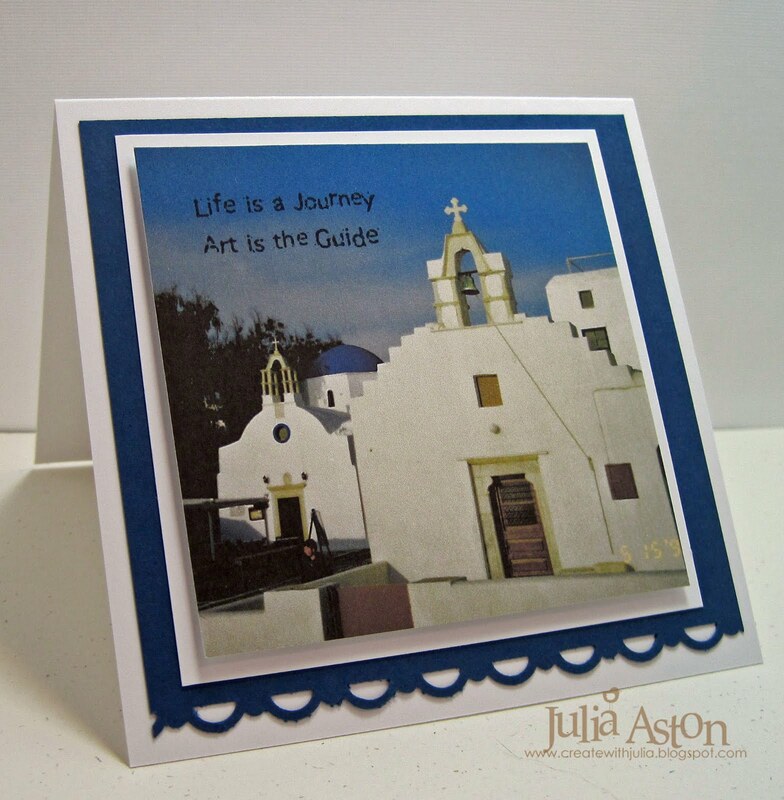 I changed the colors, the stamps and orientation of the card but kept her wonderful design and theme. I thought these colors and sentiment would make a good masculine graduation card. 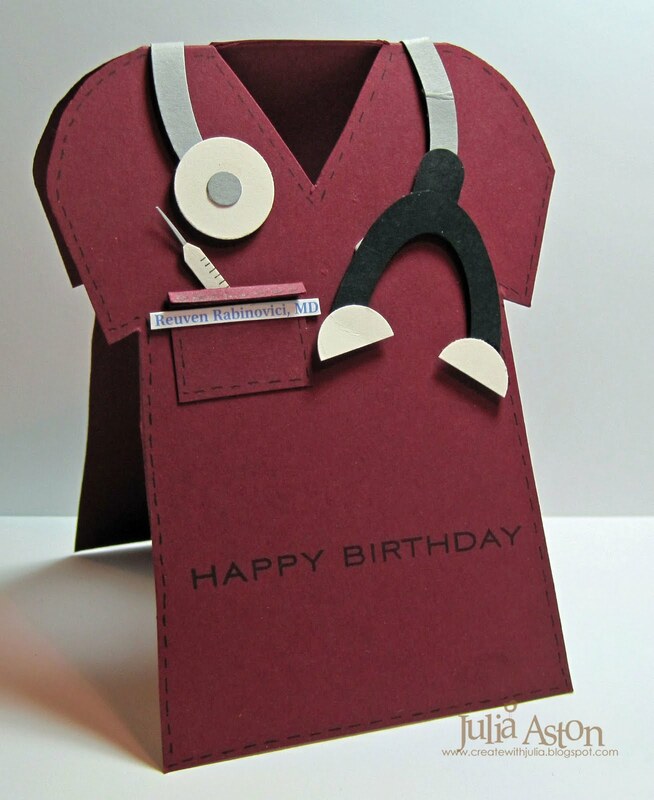 I've been busy this week making a birthday card and gift box for the physician I work for as well as some tags for gift baskets our Dept put together for Nurses Week and EMS Week - I'll be sharing those here soon! ETA: under "Toot My Own Horn" category (!) 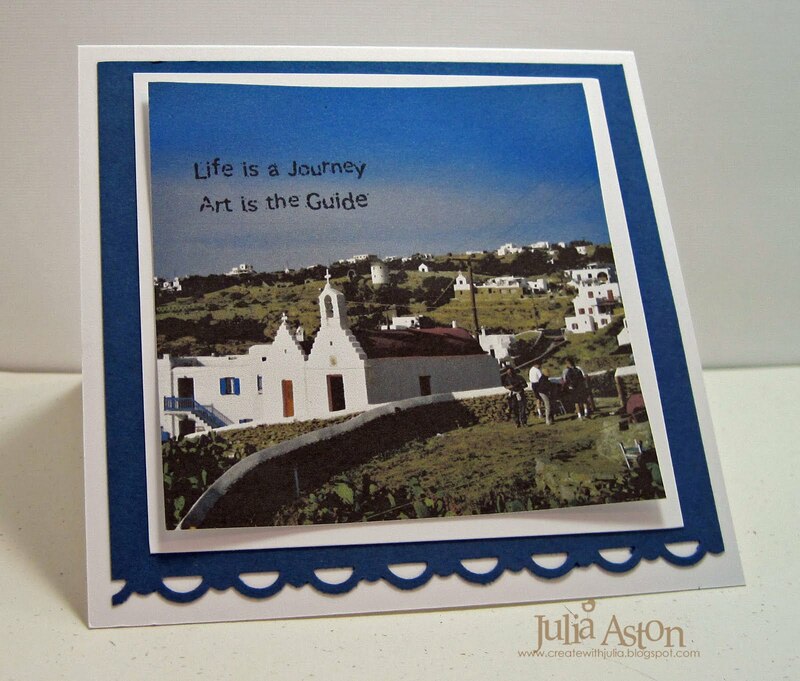 I was listed TWICE over at Card of the Week Blog and Best of the Blogosphere - see Create with Me under Card Sets and Birthday categories!! whoo hoo!! 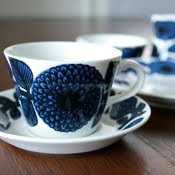 A fun home goods web site, The Huset Shop, from Sweden was hostess Anne's inspiration challenge for us today over on Split Coast. I chose this lovely tea cup as inspiration because I've been dying to try my new tea cup template from Waltzingmouse Stamps! I just printed out the template on white card stock, stamped the Big Blooms on the teacup and saucer pieces and assembled as instructed! How fun is this!! I used Taylor's Friday Sketch for my coordinated get well card. 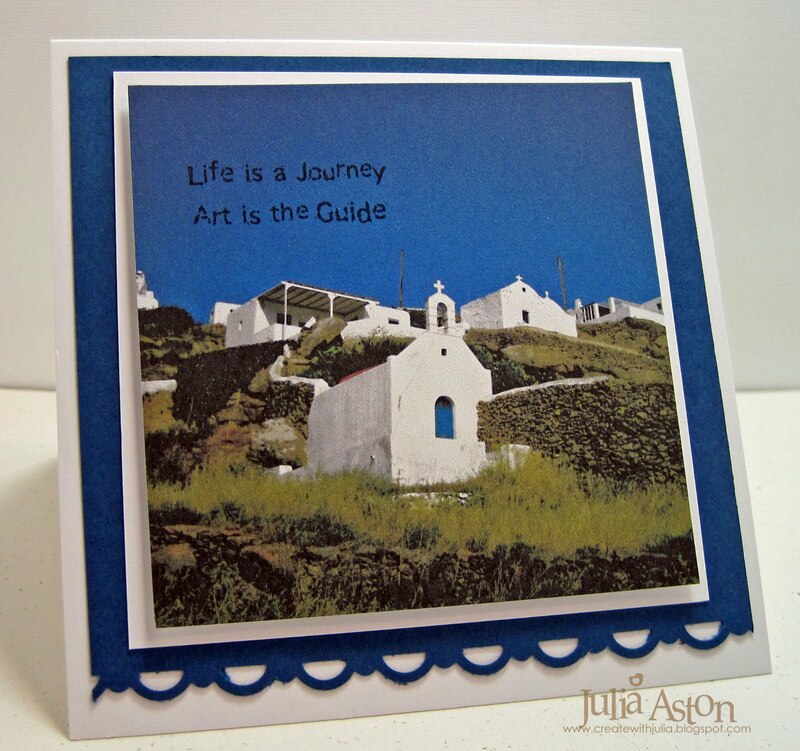 The designer paper panels are WMS Digital Celtic Squares papers. The sentiment is cut with Labels Nine Nestabilities and the chrysanthemum is cut with Circles Nesties. 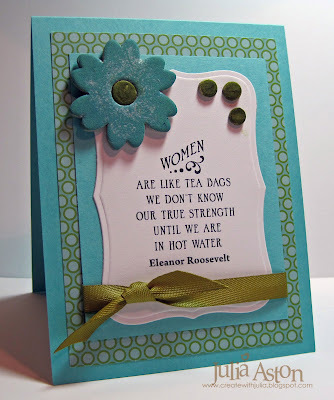 My project also counts for Sharon's No Time to Stamp Friday challenge - to make a female oriented card (or Mother's Day). I think a tea cup fits the bill!! Happy Mother's Day to all you wonderful mother's out there! My son is taking me out to dinner tomorrow -whoo hoo!! 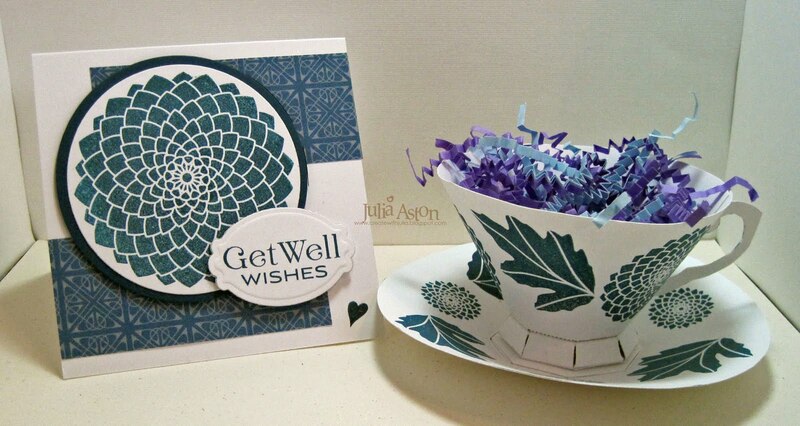 Accessories: Tea cup template - Waltzingmouse Stamps, scor tape, exacto knife, Labels Nine & Circles Nestabilities, Cuttlebug, foam dimensionals. 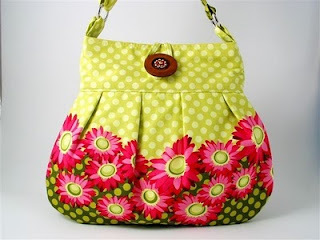 This also covers the Moxie Fab World Tuesday Trigger which is a bright green bag with red and pink flowers from an Ebay shop! 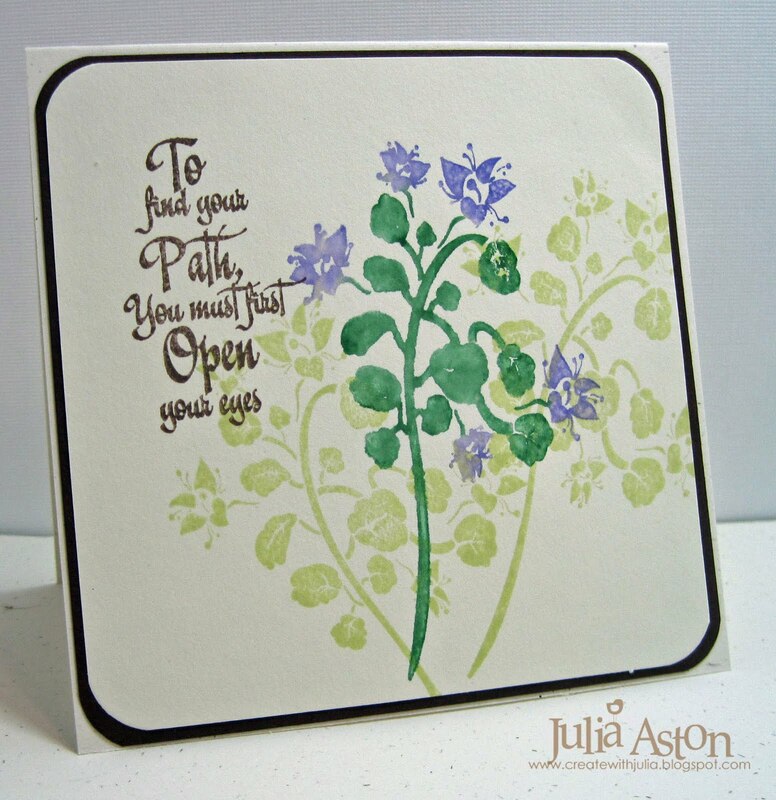 All my stamps are new releases from Waltzingmouse Stamps: Big Blooms and Fancy Phrases. 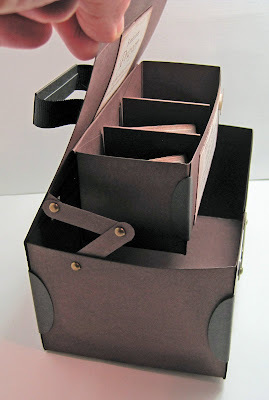 You can find Mel's fun little purse template here in the SCS forums. I made this card for last weeks Ways to Use it challenge over on Split Coast - to use chipboard on your card. My flourish is a Tim Holtz Grungeboard colored with my ink pad. 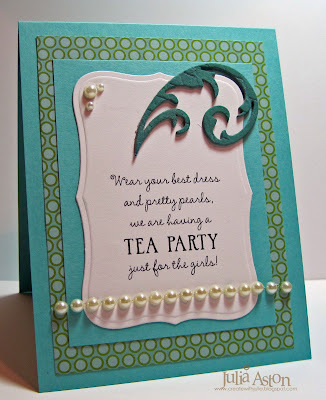 The fun teaparty sentiment is one of the new sets just released by Waltzingmouse Stamps called Afternoon Tea Sentiments. I used last week's Mercy's Tuesday sketch for my card. Then, since I had all the supplies out as well as a pile of chipboard shapes (! ), I made this second card using the same sketch but different chipboard and another fun quote from the Afternoon Tea Sentiments set. Hmmmm - I'm suddenly craving a cup of tea!!! 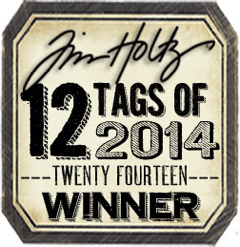 Oh- and Claire has picked the winners from our WMS DT blog waltz - check that out here. Thanks Anne for the terrific Jazz It Up Home Interiors web site for our inspiration over on Split Coast this past Saturday. 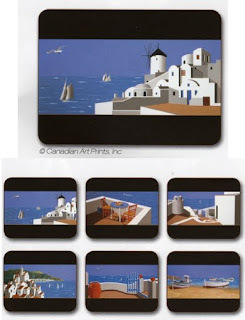 I looked in the coaster section and when I saw these scenes of Mykonos I immediately knew I'd use photos for my cards. Kent and I were fortunate to be able to travel to Greece in 1998 (seems like just yesterday!) and part of our tour was a day trip to the beautiful island of Mykonos. These pics are several of the churches/chapels that we saw on the island. Just look at that gorgeous blue sky and wonderful sun! 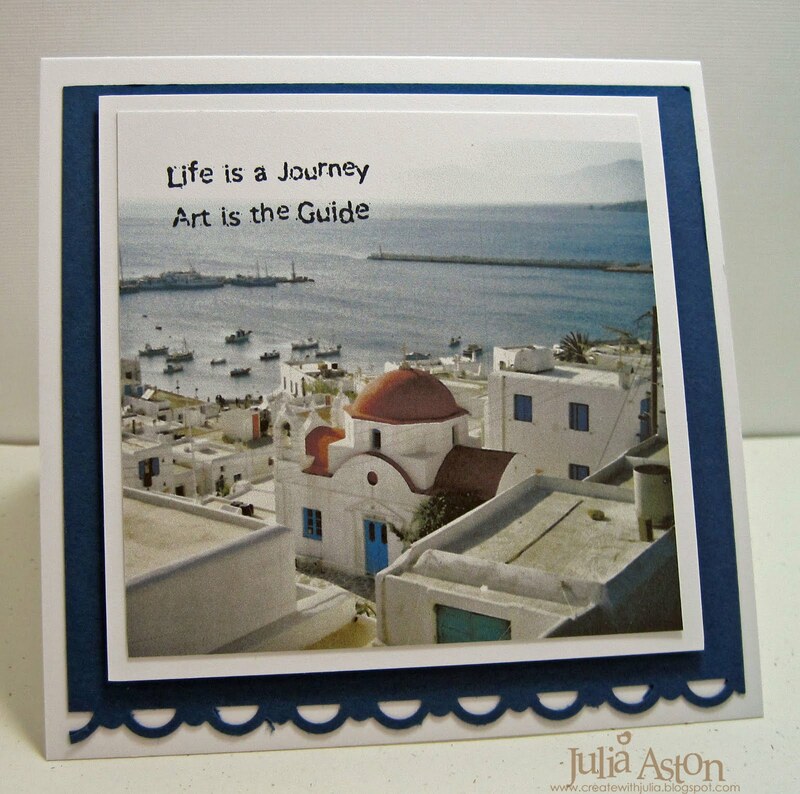 I was so inspired by all the coasters on the Jazz It Up Home Interiors inspiration web site - I just had to make another set of 4 1/4" x 4 1/4" cards! 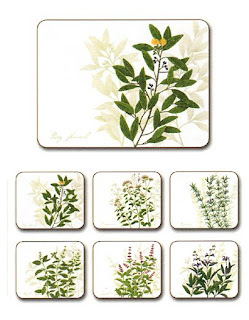 My second set was inspired by these Kitchen Herb Coasters. 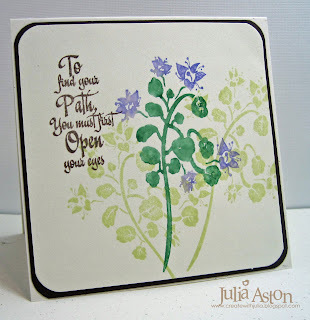 I used some of the new weeds and floral stamps from Rubbernecker , first stamping two times with Willow ink - then coloring the stamps with SU markers - spritzing the stamp with water and stamping over the first stampings. I love how these came out - just like the coasters! !